Buy this item and earn 555 ClubPoints. 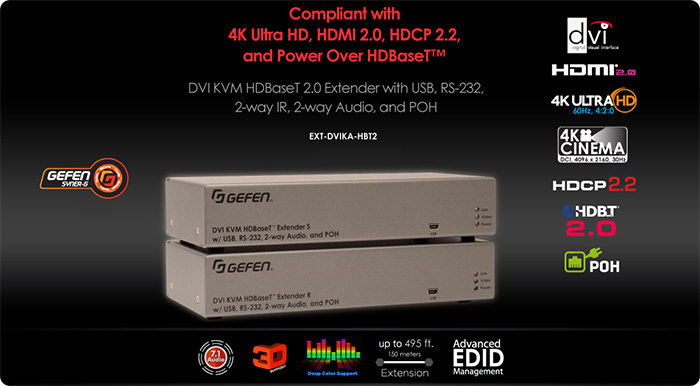 EXT-DVIKA-HBT2 uses Gefen's implementation of HDBaseT™ 2.0 technology to extend DVI over a single CAT-5e cable, up to 495 feet (150 meters). 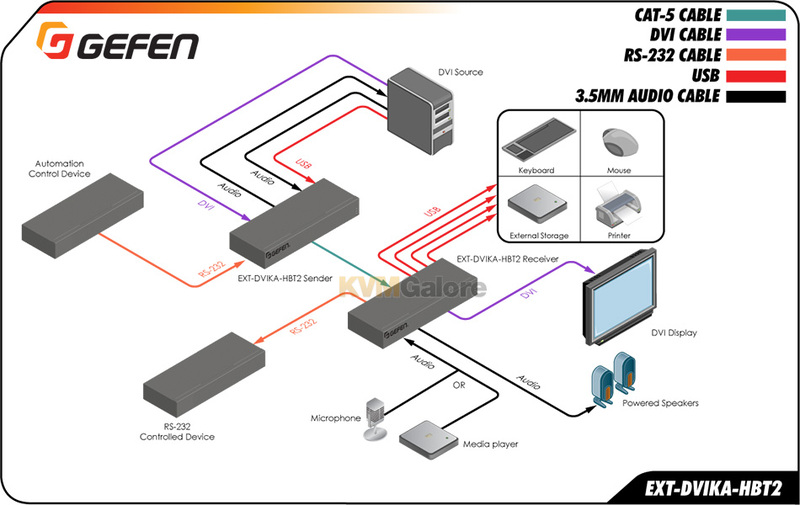 HDBaseT™ 2.0 Colligo™ platform provides additional features such as USB and 2-way audio extension, and ensures an even more robust and resilient connection than the industry standard HDBaseT™. Resolutions up to 1080p and 1920x1200 (WUXGA) are supported. HDMI resolutions up to 4K DCI-Cinema (4096x2160 @ 30 Hz 4:4:4) and 4K Ultra-HD (3840x2160 @ 60 Hz 4:2:0) along with 7.1 channels of LPCM and HBR (High Bit Rate) lossless digital audio are also supported when using Gefen DVI to HDMI cables. Supported HBR formats include Dolby Atmos®, Dolby® TrueHD, DTS:X™, and DTS-HD Master Audio™. USB, RS-232, and 2-way L/R analog audio can be extended between the Sender and the Receiver to accommodate a complete workstation including keyboard, mouse, select USB periperals, microphone, headphones, and powered speakers. 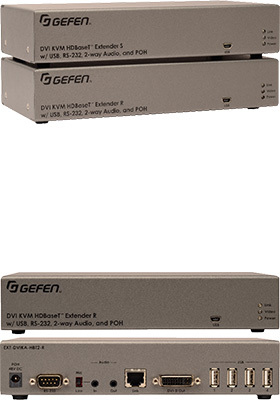 PoH (power over HDBaseT™) technology provides power from the Receiver to the Sender unit, using the same CAT-5 cable that extends the DVI, audio, and control signals. Only the Receiver unit needs an external power supply. The PoH standard ensures compatibility with other PoH class-compliant devices. Gefen Syner-G™ software with its powerful EDID management capabilities speeds up configuration, performs real-time performance analysis via Link Monitoring, and simplifies in-field firmware updates. 1U tall, half-rack-width enclosures can be surface-mounted, installed in a standard 19-inch rack using rack trays*, or be placed on a shelf. Installation tip: Shielded (STP) CAT-5e or better cable is recommended. Unshielded (UTP) CAT-5e or better cable may be acceptable depending on cable quality, but results could vary. Care should always be taken to keep the link cable away from power lines and other sources of electromagnetic interference. Listed below are additional products to consider which are compatible with DVI KVM HDBaseT Extender. These items may be required to complete your system.